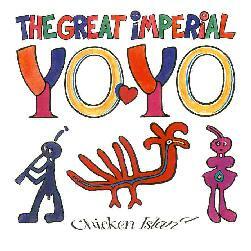 The Great Imperial Yo Yo - "Chicken Island"
From the UK, Great Imperial Yo Yo are a six-piece consisting of guitar, bass, drums, keyboards, horns, winds, and vocals. The catalog I got this CD from described their music as the Ozrics meet the Bonzo Dog Band. While the Bonzo comparison is probably seen in this band's tremendous sense of humor, to my ears the clearest comparison is Gong. Yet the Yo Yo's are no throw back to the 70's. Their sound, though very much in the psych realm, is very fresh for the 90's, with outstanding musicianship and well structured compositions. The Gong influence is most apparent in songs like "The Mighty Frog", "Sticklebrick", "Mollusc Murder", and "Time Soup". Lots of jazzy psych and excellent use of horns and winds. Even the band member names - like Paul DO-hat Lung Tongue Newman, and Rich Saxaheadphones Walker - hail to Gong (or perhaps Beefheart?). Humor prevails in songs like "Irving's Moustache", a freaky, and quite catchy, acoustic ditty that had me "La La La'ing" along with it. "My Foot" is a one minute almost vaudevillian piece. And "The Fungarian Hoax Song" should have been called The Fungarian Wedding Song as it sounds like a riotous Greek (or Fungarian?) wedding tune. I'm sure these are where the Bonzo comparisons came from. Among my favorites on the disc: "Undergrowth" is a heavy, trippy, tribal, space funky instrumental journey. At ten minutes it stretches out all over the place and has some great guitar work. "Endless Cones" runs a gamut of comparisons from Gong, to Nektar, and on to the Ozrics (but better). It starts off dark and brooding, but quickly evolves into a cosmic jazz-psych piece. Dynamics shift continually between the subtle and the intense. "The Circus" is a quirky, beautifully crafted composition that actually does sound like a psych-circus. My wife, without even seeing the CD cover, said "it sounds like a whacky circus song". Finally, "Vapour Snakes" is the spaciest tune on the disc and certainly the one that garnered the Ozric comparisons. The song starts off very beatnik-like and slowly shifts into a cosmic space jam. Not fast-paced, but intense all the same. In summary, this disc was quite a surprise. I was thrilled with the musicianship and creativity. The songs are more composed than jamming or improvisational, but for this band that's a plus. Highly recommended.